We get a lot of coffee shops and avid coffee drinkers inquiring about what gas they should be using to serve nitro coffee on draft with. Should we use pure nitrogen or a beer gas mixture for serving nitro coffee? If you are unfamiliar with beer gas, it is nothing more than a mixture of Nitrogen and CO2. Typically around 75% Nitrogen and 25% CO2. Beer gas is used typically when serving a nitrogenated style beer, such as Guinness or Boddingtons, out of a stout faucet. Beer gas will help to carbonate the liquid since there is a small amount of CO2 in the gas, but since the majority of the gas is nitrogen, you will be able to serve at high pressures through a stout faucet without pouring a full glass of foam. Pure nitrogen will not carbonate your liquids like CO2 will. Also, having CO2 in your gas will help to give your pour that nice cascading effect that everyone loves seeing in a freshly poured pint of Guinness. To help avoid any confusion, we will refer to 2 types of draft coffee below. 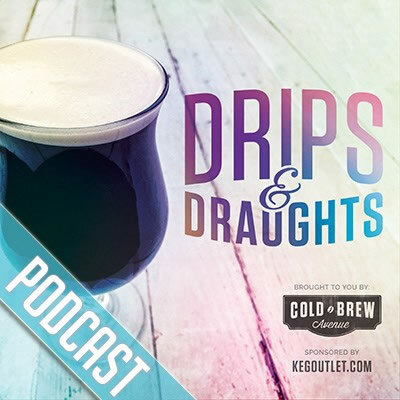 Nitro coffee (which is served out of a stout faucet at high pressures, like a Guinness), and Flat or Iced Coffee (which will be kept flat to be served over ice for iced coffees and served out of a standard beer faucet). Off Flavors: What we found was that anytime CO2 was introduced to coffee it would change the flavor and mouth feel of the coffee slightly. It would make the coffee slightly bitter tasting and give it an almost sticky mouth-feel. When serving the Nitro Coffee it was less noticeable since this was served out of a nitro faucet at high pressures, giving your coffee that creamy/frothy mouth-feel anyway. However, over an extended period under pressure, the coffee does start to take on more carbonic acid from the CO2 and give an undesirable bitter flavor. As mentioned above, using beer gas will allow you to achieve a cascading effect with your nitro coffee pour much quicker than using 100% nitrogen if that is something that is important to you. Bubbly/Carbonated: Many people like to have both Nitro Coffee and Flat/Iced Coffee on draft. When doing this you typically use the same gas for both coffees with a dual body regulator. The pressure will be set differently for each, but there is no point in having 2 different tanks for 2 different coffees when you can have a regulator control pressure to multiple kegs. So if you plan on serving both nitro coffee and iced coffee on draft you are almost forced to use pure nitrogen. With iced coffee on draft you will notice any hint of carbonation that makes its way into your coffee because this should be completely flat. With beer gas, that small amount of Co2 will be noticeable as little as a day or two, even when kept at low pressures. Using pure nitrogen eliminate any worry about carbonation appearing in your iced coffee, and you wont have to worry about any flavor changes either! In the end, we have learned it is just better to use 100% pure nitrogen when serving cold brew coffee on draft. You want to enjoy that rich flavorful cold brew coffee, without compromising the flavor or mouth-feel by using beer gas. There is nothing worse than making a large batch of cold brew coffee and having it get ruined by CO2! The one, and really only drawback to using pure nitrogen is that you usually have to keep your nitro coffee under pressure for a longer period of time to establish that rich, frothy head on your pours. We typically leave our keg in refrigerated temperatures, at 35-55 PSI for 24-48 hours before serving and we get a great pour every time!